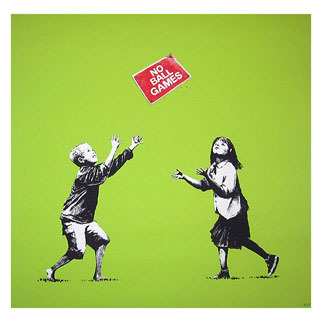 Banksy, the worlds most famous and most secretive graffiti artists, translates his notorious style into bold prints. Arguably the most controversial street artist in the world, Banksy has developed an entire art subculture devoted to his works. Banksy’s art can impact any location at any given moment. His identity remains unknown, even after over 20 years of being involved with the graffiti scene. He has worked with many different types of street art media and street art types. His work not only includes many powerful, often controversial images, but they may also be found throughout the Internet as viral images. His artwork has appeared throughout London and other locations around the world. Bansky’s artwork is characterized by striking images, often combined with slogans. His work regularly engages political themes, satirically critiquing war, capitalism, hypocrisy and greed. Common subjects include rats, apes, policemen, members of the royal family, and children. In addition to his two-dimensional work, Banksy is known for his installation artwork. One of the most celebrated of these pieces, which featured a live elephant painted with a Victorian wallpaper pattern, sparked controversy among animal rights activists. He was the subject of a 2010 documentary, “Exit Through the Gift Shop,” which examined the relationship between commercial and street art. Very little is known about Banksy himself, as he refuses to be interviewed and keeps his identity carefully maintained. A world-renowned mystery man, Banksy has risen through the ranks to become one of the world’s greatest street artists partly by creating an urgency to understand his character. Street art fanatics are consistently satisfied with every piece of art he delivers, though he often leaves them wanting more. This tactic carries one’s curiosity to explore a completely new perspective or idea, leaving his artistic creations to inspire beginning and advanced artists.